Totally Icky : 'Make Up' Your Mind! I was planning a trip to Westfield and the day before I started doing my nails, searching up videos, looking for advice on how to do cover up make up, then ended up asking one of my friends, (who is an amazing make up guru) the difference between a primer and ect. Then started planning the things I wanted to buy. The thing I think is worrying me the most and the thing that probably worries at least 75% of the teenage race is what does my face look like? Can they see my spots? Sure everyone has spots but why is it that mine is much more obvious? I remember watching an old episode of the sleepover club on Pop girl. And one of the girls had a spot and actually turned up with a paper bag over her face. Her friends then gave her a long speech about being beautiful and staying true to yourself, she went to school without a bag and everyone was happy and thought she was beautiful then rainbows arrived and unicorns gave out free Sainsbury's taste the different cookies. It didn't quite go exactly like that but you get the idea. My point is yeah I love make up, (even though I cannot apply to save my life) and of course need my daily dose of Michelle Phan to give me some advice on how to do a smoky eye. 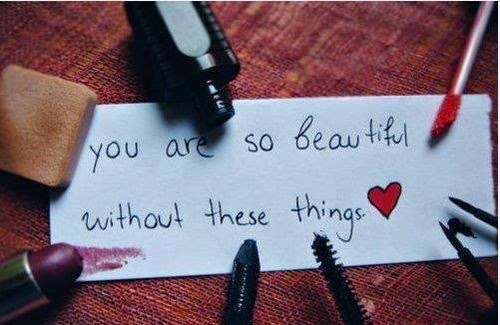 You must love make up too who doesn't but why do we love it so much it controls our life? That we cannot even nip round to the corner shop without applying foundation and concealer? Are we ugly or do we just think we are? If you repeat the same thing over and over to yourself your brain starts registering and believing it. So if you repeat 'I'm ugly' then you truly think you're ugly and other people will think so as well. But if you say bish. ( *_*) I am bootiful. Then dayuuum girl you are! You already are. If you have spots then you do and you don't like to show them that's fine you are not the only one insecure about spots if you want to wear make up be my guest, I do! Just remember no one can tell you what to do. No one can decide whether you are ugly or pretty. And everyone is pretty, no one is ever ugly and can never be ugly.